Today is the fourth day of the beer advent calendar. We have gone from Norway to Finland, over to the UK and now ALL the way over to Portland, Maine. Opening these beers every day is almost like putting together a puzzle. Where will they be from? How will they be organized? How many from each area will there be? All these questions are not answerable until all 24 beers have been revealed. Today’s beer comes to us from Peak Brewing Company in Portland, Maine. When I first opened the bottle I had thought it was from Portland, Oregon, widely known as Brewvana, for the sheer number of craft and microbreweries. I am not disappointed, actually the opposite, I’ve never heard of this brewing company and I’m rather intrigued by their mission. Peak Brewing Company is all about sustainability. Combining unique flavours, local produced ingredients, and sustainable brewing methods to create their beers. Sometimes when I read a beer stating it is “organic” I often think of it being used as a buzzword. It is nice to find this brewing company actually works quite hard to locally source their ingredients and to make certain they are grown organically. The head brewer, Jon Cadoux, started off home brewing beer in the 1990s. He decided to combine his passion for beer with his passion for sustainability and the result is Peak Brewing Company. They brew 17 beers either produced on site or in collaboration with others. The beers are all rather unique including a Maple Beer, Espresso, Pomegranate, and even a Mocha Ale. 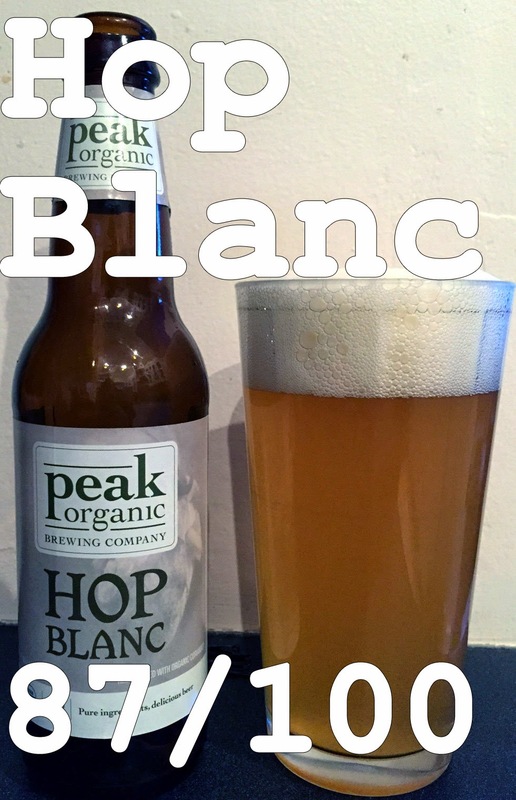 The beer that I have the pleasure of trying today is their “Hop Blanc” white IPA. White IPAs are in fact Belgian wheat beers that have been hopped like an IPA. This means they have similar color, body and esters of a wheat beer with a noticeable hop aroma, flavour and bitterness. Not all White IPAs - nor even IPAs - are going to be the same. There are a number of different varieties of hops that give different flavors. With the number of possible combinations it leaves limitless opportunity for flavor palates. White IPAs being wheat beers as well typically have more citrus notes and tend to be “fruitier.” Really though, it depends on the brew master and their vision of the beer. So it will be interesting to see what this one, hopped with Centennial, simcoe and citra hops, will taste. I’m expecting, based on those hops, a tropical and citrus front. On to the beer! Appearance: Golden brown and cloudy with a good amount of head that dissipates slowly. Smell: Hops, Citrus and passion fruit. Taste: The hops, citrus and passion fruit flavours really come through in this beer. There is only a little bitterness from the hops which works well with the overall flavours. It is really well balanced. There are hints of cinnamon at the very end left on the tongue which is interesting. Great balance of flavours. Mouth feel: Smooth and medium bodied. Not too heavy which is nice. Overall: The hops used in this provide just enough citrus and passion fruit to add the complexity to the beer while balancing out the bitterness. This is an excellent example of a white IPA. Do I like it: I typically am not a fan of White IPAs but I really love this one. It is a fantastically balanced White IPA that does not focus too much on the wheat ale nor the bitterness. This is my favourite so far (not saying much considering it’s day 4).